sneak peek | Inside the mind of lulupants! Every year my little one writes, no wait makes a letter for Santa so he could have an idea of what she wants for Christmas. By makes I mean she saves all the promotion booklets that stores send out for black Friday, and cuts all the things she is interested in and glues them on a paper. I love seeing how enthusiastic she is. She wont let me see the letter so I always have to sneak a peek when she leaves it in the stocking for Santa to pick up. Every year I look and think how cute she is and how awesome it is to have such expectations. This year when I looked I saw a very funny surprise for Santa. 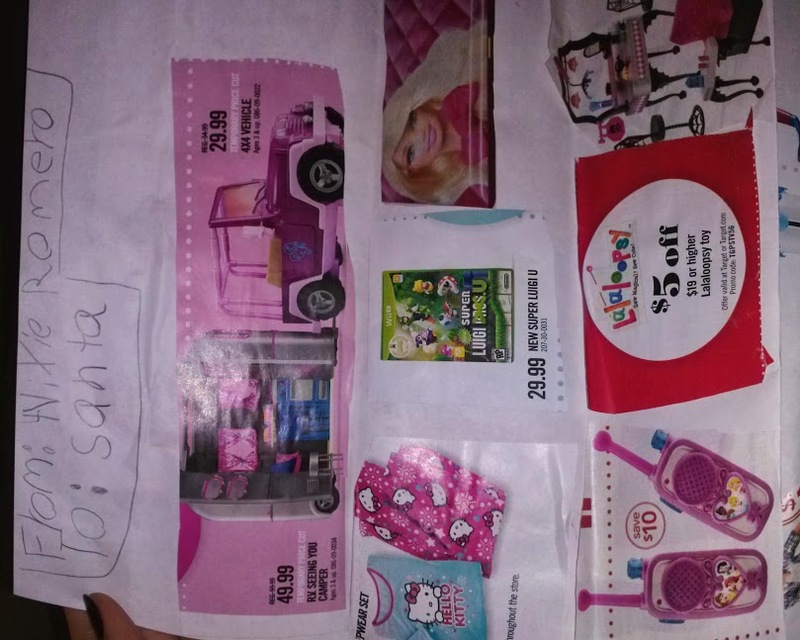 Yes that’s a coupon for Santa to save $5.00 off of a Lalaloopsy doll. I guess she sees me coupon from time to time and wanted Santa to save a little on her gift.